Do you have your heart set on Quartz worktops in West Kirby? It sometimes happens that our clients stop by our showroom at David Williams to ask about our well known marble or granite worktops. Before they leave, some choose our quartz.It’s not surprising since quartz has a lot to recommend it. The old adage “you can’t improve on nature’ does not apply to stone worktops. Quartz is proof of that. The stone is crushed and then mixed with resin and that human interference results in the most durable and toughest material you can choose. In addition, the resin mix can be used to add colour in creative ways that result in solid colours or the look of solid granite or marble. The durability winner is quartz, the man-nature combo countertop. 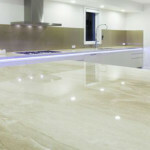 In West Kirby, quartz worktops is nearly maintenance free. Crushed quartz stone is mixed with resin to produce countertops that range from solid colors to the look of real granite, but they’ll beat natural stone in toughness.In fact it ranks 7th on the Mohs hardness scale. The harder the stone the less likely it will scratch or chip. It’s also non porous so although it requires no sealing it still won’t stain under normal use. Non porous also means more hygenic. It’s so hard, bacteria can’t penetrate. Just wipe it down and Quartz is ready to install and use right out of the box. Quartz worktops in West Kirby may be, environmentally speaking, the greenest stone. You’ve probably heard about radon which is a natural gas throughout our environment including in stone. When trapped indoors, concentrated amounts can be a health risk. Studies have found that quartz emits the lowest levels of radon compared to other stones. There are many benefits to be had when you choose a quartz worktop. Contact our professional designer craftsmen at David Williams to guarantee the finest quality stone and the perfect design and professional installation. We are definitely of the belief that one should measure twice and cut once for a perfect fit. That’s why we build a template and make sure it fits your space before we ever start cutting the stone. Your satisfaction is guaranteed. This entry was posted in Quartz Worktops and tagged Quartz Worktops in West Kirby, West Kirby Quartz Worktops. Bookmark the permalink.